My husband had his medical today and he had to see a psychologist because of his tattoos. The psychologist told him that he should've filed the waivers first than go through this process. But I researched about it and it says you file the I-130 go through the process and when you get denied than you file for the waivers. I just would like your knowledge because if that is the case it took us 2 years to get to this point. So my husband had his interview today in Juarez and he was given a white paper saying he was ineligible to receive a visa under section 221g. So my husband was told that he has to file waivers. The Immigration officer told my husband that we did the process backwards that we should've filed the waivers first. He told him you came over here for me to tell you that you are denied because you need to file waivers. The lawyer I had told us that we had to go through this process and get denied and than we can file the waivers. I'm so confused and mad. Now we wait for the letter to come to DHL to let us know what waivers he has to file for. But at the same time we were expecting him to get denied because the lawyer had told us that. But to hear the immigration officer tell us we did it backwards makes us mad. I've also read it on here that we have to get denied at the interview before we file the waivers. My husband had to see the psycologist because of his tattoos and she asked to see his criminal record and told him the same thing that he should've filed the waivers first and she said that she doesn't see him having to file any waivers after seeing his criminal record. There are 2 different processes. One is for people who reside OUTSIDE the US, the other process if for people who are currently IN the US. For those outside of the US they file 130, have an interview at a consulate outside of the US, are denied and then have to file a waiver. For people in the US there is a process for filing a waiver FIRST along with the 130, you get the waiver approved and then leave the US to have an interview in a consulate abroad. They allow you to get 'pre approved' for the waiver so you do not have to wait out the waiver processing time in another country. You have been found ineligible to receive a via section 221g of the immigration and nationality law because your application is incomplete. To continue with your case you must follow the following instructions. You have been found ineligible to receive a via section ﻿221g of the immigration and nationality law because your application is incomplete. To continue with your case you must follow the following instructions. I am from Guyana and my husband was given a white slip saying he's ineligible but wasn't as for any more documents or even told anything I am the petitioner and I accompanied him they told us at first we were approved then after the offer met with his supervisor he told us his supervisor put our case in Administrative Processing. 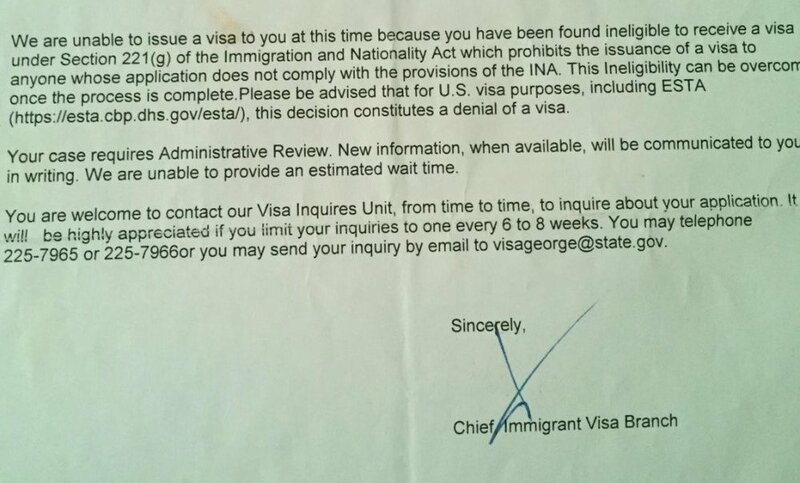 Should I file a wavier or wait to hear from the US Consulate in Guyana? How does one know when he/she should file a wavier? Does the Immigration officer advise you of that or you have to wait for them to conclude there Administrative Review investigation? Please advise? Thanks much! !